Self-proclaimed bachelorette Athena Di Jasper is at the top of her game. Her online magazine is thriving, and she's in a comfortably static relationship, free of the kind of commitment that could lead to marriage—she's seen her parents' rocky union, and it's not for her. When her on-again, off-again boyfriend Karl wants to move their relationship to the next commitment level, Athena's obvious dismay leads him to challenge her workaholic tendencies. His accusation is true: she hasn't even paused to read a novel in years. Determined to prove Karl wrong, Athena takes a break from her hectic schedule to peruse a used bookstore, where she meets Grey, the intriguing—and single—propietor. Her quest for change and her desire to see more of Grey leads Athena to stray from her to-do list and join the Newport Ladies Book Club. When Athena's world is turned upside down by a family tragedy, she's left to care for her terminally ill father. Juggling the demands of attending to an ailing parent and running her business, Athena comes to value the friendships of the book-club members, and she find herself relying more and more on Grey's support. When she stumbles across an old shoebox in her mother's closet, she's stunned by its contents, which hold unexpected truths about her parents' relationship. As Athena delves into a past that defies her judgment about her parents' marriage, she is forced to reevaluate her views on life and love. Athena, like each of the other Newport Ladies, was a joy to get to know. I'm so glad there are more books to look forward to. My circle of friends just keeps growing! Seriously, I find comfort in these books as I read about women so much like me and my friends. Thank you, Heather! This is officially my favorite of all four books. I have not really read any of Heather Moore's books so this is my first glimpse into her mind. She is a fantastic author. This is not just a story about Athena, but a story about the love between a husband and a wife, and the truth about the obstacles we put in our own way in life. If you read no other books in this series, read this one. Moore will be on my short list from now on. I read Athena in about 12 hours. I was completely taken in with Athena's story. Athena is the last book that takes place during the same time-frame as the first three books.All four books were written as a parallel series, not as a forward-moving series.They cover the same book club meetings and events in all four books. This last book is probably the most different from the other three. The main reason is that main character Athena kept to herself a lot more than the other characters in this series. While reading the other books, the reader could get the impression that Athena is cold and not truly interested in the book club. This is so far from the truth as you read this fourth book. Athena has a lot going on in her life. She is single, runs her own company and is very conflicted about getting married and having a family. Her Mother wants her to marry a nice, Greek boy and stay at home to have babies and take care of her man...just like she did in her life. Athena has been very critical of her parents and their marriage, but events happen that change her life. She meets a new man, very different than the man she has been dating previously. A death in the family and a major life decision make Athena face some of the harshest trials that life can bring. I read Athena in about 12 hours. I was completely taken in with Athena's story. Heather Moore's expertise as a writer shows as she develops this character. The growth arc that Athena takes is so huge as she makes decisions that not only change her life, but those she loves. 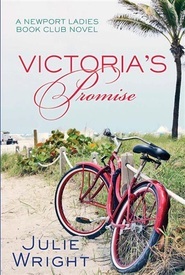 This book truly brought full circle the stories of the four women in this series. It felt so satisfying to finish this book and feel that sense of completion. The next four books in the series will be about four other book club members in a new time frame. Each of the authors will take on this new writing challenge. I highly recommend Athena! This story is full of heart-wrenching moments, friendship at it's finest, and a love story that made me cheer, moan and melt. How is that for a combination? Athena's romance with Grey, the book store owner, has turned out to be one of my favorites for 2012.If you haven't started this series, pull out the tissues, reserve several hours to yourself and get ready to be pulled into the world of The Newport Ladies Book Club. You will find women of strength, strong friendships and stories that will make you look at your own life in new ways. It is not often I can read a book that touches the sweetness and kindness of the human heart and soul. This book seemed to pull together all of the previous books written so far. I have read all of them and the women in the book club seemed more real, likeable, human, and someone I would like to be friends with. I felt this episode revealed the little acts of everyday kindness and the consequences as a result. I especially liked the agony Athena experiences and the journey she makes to self realization that she is worthy and capable of a fulfilling life. Where was Gray when I needed him years ago? This was a caring and deserving man. His past flaws are what made his constancy such a joy to read about. Actually I want more of Athena and Gray! I can hardly wait to find out the background stories for the rest of the Book Club. Hurry please! Athena is a self-proclaimed bachelorette—it’s better that way—no one gets hurt. But when tragedy strikes, Athena realizes friendship and love is the only way she can pull through, and she must, for the first time in her life, risk opening her heart. Athena is the fourth book in the Newport Ladies Bookclub series. If you are familiar with these books, you know that they are each stand alone novels that follow a group of women who have met at a book club. Athena is the president of her own company. She is in her thirties, and has a comfortable, casual dating relationship with Karl. But when he wants their relationship to become more serious, she ends it and resigns herself to the fact that she is just not the right kind of girl for married life. She doesn't need anyone, and after watching the way her father dictated her mother's life, she is skittish about letting anyone close to her. That was until she met Grey and started thinking that he was somebody she could get serious with. Grey is a sensitive character without being whiny or lame. I connected with him right away, and I also loved that he isn't perfect. He is a great romantic lead, because he's struggling with the idea of being close to someone just as much as Athena is. When her mother dies, Athena finds herself relying on Grey to help her through not only her mourning, but the trials and complicated feelings of caring for her father. I loved Athena. The characters were so complex and dealt with their realistic problems in a realistic way. It is beautifully written with a wonderful story, and by the end, I felt that the characters had changed and grown, and it was satisfying as far as character arc. There were parts where I teared up, and also places where I laughed out loud. Athena arrives in my mailbox like a gift. I don’t even force myself to wait to begin reading. This is like catching up with old friends or a terrific talk-fest with good people I know who will share with me another side to the story. Let me at it. Athena is a puzzle of a woman. She seems well-ordered and efficient, working as she does from her Newport apartment with the terrific view, making an independent decent living by keeping her online magazine afloat. Her first conflict is a breakup with her photographer that she has sort of dated coupled with a date her mother pressures her into going out with a “nice Greek boy.” She doesn’t seem to really connect with any of the men in her life, until she meets Grey who comes, we discover, with an issue of two of his own. The catalyst in this story—as we already know from the first three books in the series—is the death of Athena’s mother in a car accident. As Athena picks up the pieces of her life she takes on the added difficulty of caring full time for her aging father who is struggling with Alzheimer’s disease. Her well-ordered life spins out of control as she wrestles with real challenges and sorrows and, frankly, matures into a woman that has much to give and more depth than we thought. Award-winning writer Heather Moore has crafted a character with depth and growth to spare. She uses a light touch with the pain and sorrow that necessarily surrounds the situation but lets us also feel the depth of Athena’s conflict as she wrestles with her own Greek tragedy surrounding her mother’s untimely death. Enter the bookclub and the books they examine together. Concepts from the discussions help the main character’s growth. I like that. Even though we have looked at these books in the three previous volumes of this series I stay eager to see what Athena’s thoughts and understandings will be. In fact, I looked back in my notes with some previous questions I had and found one of them answered in this book. I find that careful attention to detail immensely satisfying. So, with another winner in Athena, we are on to the next four books in the series, and to the next four months in their lives. Thank you, Athena, Paige, Daisy, and Olivia. We are eager to get to know your other friends, Ruby, Shannon, Ilana, and Victoria. Long live the Newport Ladies Book Club! ""Three! Four! Five! Six!" My class chanted in unison, but it sounded more like we were just grunting." Athena was another great book in the Newport Ladies Book Club. Athena is a smart, and sassy, businesswoman with a successful online business. She worked hard to get where she is and she feels happy. Everythings going well. Until the convenient boyfriend wants more from her and accusses her of not being well-rounded. This leads Athena to buy a book to prove she still reads. While in a local bookstore she's introduced to two things that will change her life: the bookstore own and a bookclub. In Athena's personal life, she's worried about her father who has dementia and her mother as the caregiver. When a tragedy strikes, Athena must rely on other's for help and support, a hard choice for independant Athena. I also liked how Athena's perceptions changed throughout the book, in every aspect of her life: romance, family, friends, work etc. Athena is a well-rounded character, very enjoyable to read, even in the hard times. another winner for the series! Athena is book 4 of the Newport Ladies Book Club. Like the other books (Olivia, Daisy & Paige) they follow the same time period, but they don’t have to be read in order to understand the series or characters. At first, I found the book a little slow and hard to get into the story line, but realized the character herself, Athena, is “boring” at first because she has allowed her life and schedule to be the same thing day after day. She works alot so she rarely has any opportunities to do anything else. When she decides to make some changes in her life, like joining a book club and reading books based on a strangers (Grey) recommendation, the book gets more interesting. I also liked that this book seemed to have less of the other characters involvements (probably because Athena kept more to herself) so you don’t read a lot of events that are mentioned in the other 3 books of the series. In other words, you don’t feel like you are reading one of the other books all over again. I liked that this book showed Athena’s struggles to change and to understand her parents’ marriage and illnesses. I can’t even imagine trying to take care of a sick parent, especially one that could be violent or not even remember you! Heather Moore did a wonderful job of expressing Athena’s emotions and struggles. Although I couldn’t relate to Athena’s experiences like I could with some of the other characters, the book itself and the emotions was very well written!! I cannot wait to read the other set of 4 books, to be released in 2013. The other set of books will not cover the same time period, so the characters we have come to love in the first 4 books will be mentioned and we will see how their lives have changed!! Athena is my favorite in the Newport Ladies Bookclub series. I love Athena. Heather brought Athena to life for me. Her trials, her strengths, her weaknesses and awakening to experience a truly full life. 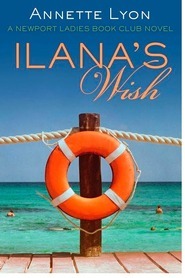 Read this book you will love it and love Athena. Accused of being a workaholic and hermit, Athena takes that as a challenge to change some things in her life. First and foremost to read a book other then her magazine. That's when she meets Grey (Owner of a little bookstore). He brings new insight into Athena's world. With her Mother's passing and now having to take care of her ailing father, will she muddle through somehow by herself, or will she let others in, who are willing to help her drastically changing life? I loved this fourth addition from the Newport Ladies Book Club! I learned so many new things about Athena, and was pleased with the outcome! Each book held something great. I can most relate to Athena being close to her age. I loved seeing her relationship grow with the other ladies and how supportive they all are for each other, even though they didn't know each other at first. I have never heard of the books that they read in the book club (except for the last (The Help) that they actually didn't start to read yet) but I enjoyed how each book had an impact on each reader. I may need to read those books now. This isn't the end of the Book Club series. Keep a look out for the next 4 books, which will come out at different times next year. With all new point of views from Ruby, Shannon, Ilana, and Victoria. We of course have met these women in this first set of 4 already out. It will be fun to see what they all have to share in their own lives. Pick up Olivia, Daisy, Paige, and Athena today and get caught up! Athena kept my interest from beginning to end....in fact I never actually put it down. Read it straight through! I immediately fell in love with her character and could identify with her struggles and heartaches. I actually liked that we didn't see as much of the book club this time. We got just enough information without having to hear it a fourth time. Athena is a cheer-worthy heroine that keeps you wanting to see her find true happiness and love. I'm sure many of us can identify with her struggle to balance work, family, and love. Loved this sweet conclusion to the Newport Ladies series. I've had the opportunity to read and review this series from the very beginning and I have really loved it. It's such a great idea to have books that cover the same period of time, yet each from a different point of view. Each book tells the story of an individual while telling bits and pieces of the other women's stories as well. Athena has some major challenges thrown at her all at once. Like all the women in this series, she is trying to figure out how to deal with life's challenges while fixing the things in her life and character that she knows need fixing. Life is hard. No matter what your profession, religion, marital status or family make-up, life is hard. I love that this series brings all those elements into the books. These women band together, support each other and share a common love of books. It's awesome. Women everywhere will be able to connect with the characters in these books in some way or another. In the end, I was proud of Athena. She dug deep and found what she needed to get through. She overcame her fears and let other in to help. It was a struggle, but she did it. So glad the authors of the Newport Ladies Book Club series came up with this idea! When reading the other books, I didn't connect with the Athena character as much as the others, but this book by Heather Moore about Athena was so enjoyable I couldn't put it down. The depth of insight into the different characters is very rewarding as told through the words of four different authors. That's what makes this series unique. This story is emotionally satisfying and left me anxious for more. Highly recommended!! I have really enjoyed all of the books in this series, but I think Athena is my favorite. I could relate to the hardships of dealing with her father. I got into the story quickly and had a hard time putting it down. I love the concept of this series and think there are many lessons to be learned from each individual story. I am excited to learn more about Ruby! Athena is the fourth book in the side-by-side storytelling concerning the Newport Ladies Book Club (since all four novels take place over the same time period). Now, out of the four books, there have been a few supporting characters. Up until this book, Olivia's older natural daughter was my favorite and most interesting. But Grey, Athena's...uh...boyfriend?...sure...boyfriend because my favorite supporting character. A lot of guys dislike the sensitive guy in...well...anything. (I maintain that Edward Cullen is by far the most unreal guy in fiction.) Grey was a very sensitive character. However, he has a past that is delved into pretty decently in this book. Of course, I'd actually like to see a book about Grey. So, this is a possible SPOILER!!!!!! so if you don't want to read any, go ahead and jump down to the "END SPOILER" point. Athena learns a little about Grey's past. His father left his family when he was younger and his mother checked out of reality. Grey blamed his mother for what she did. And Grey apparently hated life enough to have attempted to slit his wrists in order to leave this world. Grey is very embittered with his mother throughout the book. Grey also dated "project" women (for lack of a better term) as a way to cope with his mother's "checked out" status. But when he met Athena, he found someone who was different. She was a "project" in her own right, but a different project. Athena was quite bothered by how much Grey disliked (and even distrusted) his own mother. Which I found ironic because while she was alive, Athena really wanted her mother to but out of her life more. It was only after Carmen died, that Athena appreciated her mother's presence. This was another parallel for me. Something that interested me about Athena was that she played both the damsel in distress and the heroic chick toward Grey. He saved her time and again (in an emotional way) and when mention of Grey's past is brought up, she goes into this protector mode. Almost as if she wished she could go back to the past and protect Grey from his mother's depression. I liked that Grey was human. 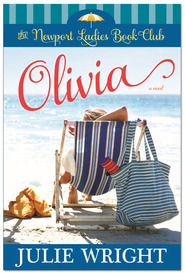 In Olivia, her husband is only a jerk because he feels betrayed and is trying to hide what betrayals he's faced. 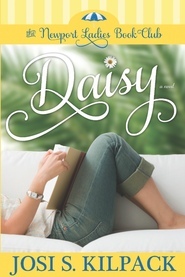 In Daisy, her husband was just selfish (enough said there). 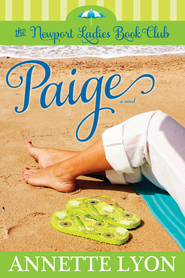 In Paige, she found Mr. Really-Good-And-Still-True, but she chose the other "men" in her life (her innocent sons). In Athena, she has a man that is human. That expresses his pain and sadness and anger and past, something that isn't "macho". Of course, I think men in generally need to be better at stating who they are and not what society dictates "should" be shared. In modern western society, it seems that men aren't supposed to have feelings, aren't supposed to have emotional pains. And I'm glad Heather Moore wrote a character that broke that stereotype. So, in the end, I really did like Athena. It was very well written in my opinion. I'm glad I got the opportunity to review this series. As much as I enjoyed reading Paige, I think I enjoyed Athena more. Not only do we get to know each of the book club members intimately with all of their idiosyncrasies and heartbreaks, we also get to see how they are viewed by each other. How often do you get a glimpse of yourself through someone else's eyes? With each book, it seems like the problems escalate, when in reality, each character had the most devestating problems for their personality types--problems designed for their own individual growth. Each of us comes with our own package of problems to work through. The ladies of the Newport Book Club work through their problems by supporting each other. Athena is a bright, work-aholic, who falls in love, in spite of herself. She uses self-imposed work expectations to avoid family and relationships. Follow Athena as she discovers what makes her tick. You'll enjoy her journey. I liked it! Definitely worth reading. 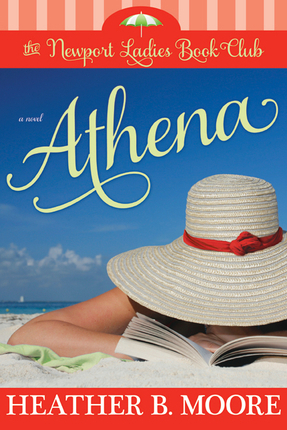 I just finished reading Athena, book 4 in the Newport Ladies Book Club series and I liked it! Author Heather B. Moore compelling captures the different facets and struggles Athena faces as a single woman trying to make her way in a successful career while dealing with the expectations of her mother who longs to see her settled with a nice, stable Greek man. And if dealing with her mother is not enough pressure, Athena struggles with the emotional loss she feels because of her father’s Alzheimer’s disease and the misunderstanding she has about her parents’ obvious unequal relationship. Despite her family turmoil, Athena discovers books and Grey, a man who gradually changes her perception of men, all thanks to a dare from her boyfriend Karl. 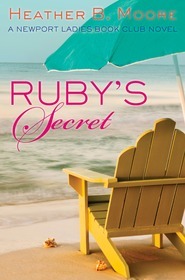 Books become Athena’s lifeline as she joins Ruby’s book club and connects with women who care about her, especially when tragedy happens and guilt follows. Moore’s honest, straightforward style draws us into Athena’s life and lets us share her heartaches and happiness, and the power women have to make a difference in other women’s lives. I just finished the last installment of The Newport Ladies Book Club series: Athena. It grabbed me right from the first and I couldn't put it down. It was such a pleasant surprise to find that it was largely a romance novel, and just the kind I like, clean and sigh worthy. Athena has avoided committed relationships like the plague and certainly isn't looking for one when a chance meeting starts a whirlwind relationship that she simply can't resist, no matter how often her mind tells her to put the brakes on. Every woman wants a Grey in her life and Athena is lucky enough to get one. Just when she's convinced he's the real deal and ready to jump in with both feet, an overheard conversation dredges up her worst relationship phobias and throws everything into question. The end was satisfying, if a bit too quick. The writing is smooth and concise. All in all, a very nice end to the series. If you haven't picked up these books, you really should! Athena is the fourth book in the Newport Ladies Book Club series, and it was my favorite. I didn't relate to Athena as much as Paige (the main character of the last book), but I could relate enough that it was a good escape. I really enjoyed the way her story was written-her realistic life had plenty of downs, but I think what I liked most about it was that it wasn't a downer. The importance of the friendships gained through the book club was more subtle in Athena than in the other books in the series, but I liked that. Sometimes it's those little kind thoughts and deeds from friends that really help us pull through the tough times in our lives. The romance in Athena was great. The relationship comes on fairly quickly due to some tragic events, but over the novel it is proven to be solid.